I wrote this poem for a Writing Poetry from the Visual Arts workshop run by Melanie Figg of The Writer's Center in Bethesda, MD. The class was held in the Summer of 2011. In the class we discussed poetry, essays, and visual art and shared a poem inspired by the visual arts for group critique. 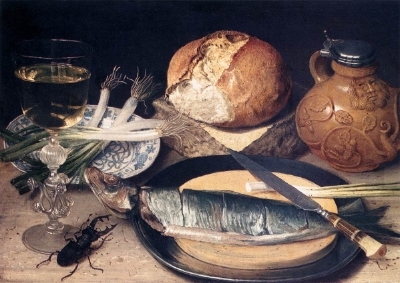 I had not typically been drawn to still lifes but wanted to explore them further to gain greater insight into their cultural significance, which was particularly strong during the Dutch Golden Age. On a museum tour that I attended on still lifes I learned that the Dutch thought beetles were responsible for house fires. I found this detail bizarre and fascinating and it gave me a focus for my poem. The rest does not matter, wiped out in black. Arch and strain trying to get back. the arsonist beetle, disturbing the peace.